Aimed at producing “memorable, complex cigar blends that move the senses and reward discriminating palates,” the California-based Ventura Cigar Co. first got on my radar in 2013 with the release of two less-than-traditional cigar lines: the uniquely presented Psyko Seven and Project 805, which sports an exclusive tobacco called Andullo. Since, Ventura has added a series called Archetype, a collection of five different blends that are “inspired by the work of psychologist Dr. Carl Jung and mythographer Joseph Campbell who defined ‘archetypes’ as the constantly repeating characters who occur in the dreams of all people and the myths of all cultures.” Three of the cigars—Dreamstate, Sage Advice, and Strange Passage—are made at Davidoff’s Occidental Cigar Factory in the Dominican Republic; the other two—Initiation and Axis Mundi—are crafted at La Gran Fabrica Drew Estate in Estelí, Nicaragua. 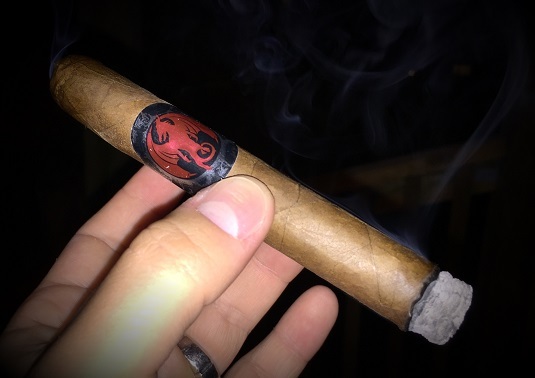 Initiation is billed as “an adventure in the art of nuanced flavor with a blend of Habano tobaccos that opens up with heavenly aromas, floral notes, white sage, and orange zest that intensifies throughout the smoke.” It sports an Ecuadorian Habano wrapper around binder and filler Habano tobaccos from Nicaragua. Four sizes are available: Churchill, Corona, Robusto, and Toro. The Corona (5 x 46) retails for about $10. It comes complete with a well-executed cap and sour, musty pre-light notes at the foot. Beneath the metallic double bands of silver, black, and red is a pale, dry wrapper leaf that’s devoid of any large veins. The cigar feels very firm and both the foot and clipped cap exhibit a cross-section of tightly packed tobaccos; not surprisingly, the cold draw is not as smooth as I would have liked. After setting an even light, the draw loosens a bit, though it’s still a little stiff. Despite this, the smoke production does not suffer in the slightest. Like many Drew Estate-made cigars, the Initiation Corona smokes like a chimney. At the outset, that smoke is characterized by flavors of dry oak, almond, white pepper, and citrus. Some background floral notes linger, as do hints of tea and salted sunflower seeds. Throughout, the profile wavers from delightful and complex at one end of the spectrum, to bland and papery at the other (most times it’s somewhere between the two extremes). I found this to be true across all three samples I smoked for this review—which, in full disclosure, were provided free of charge to StogieGuys.com. Aside from the tight yet shockingly non-problematic draw, the Archetype Initiation Corona exhibits solid combustion qualities, including a straight burn line and a solid white ash. All in all, this is one of those cigars I would hope would improve with some age. I can’t say for sure if it will but, to me at least, it tastes a bit green. While there are undoubtedly some wonderful flavors here, there are also patches of blandness. That’s ultimately why I’m settling on a score of three stogies out of five.